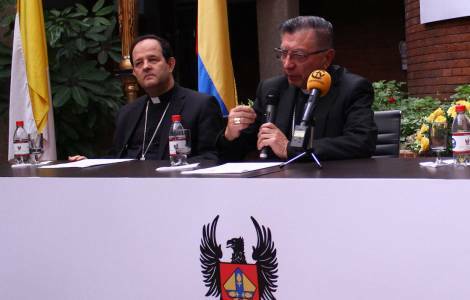 AMERICA/COLOMBIA - Bishops: "We cannot stand still in the face of the dramatic situation of the country"
Bogotá (Agenzia Fides) - An invitation to Catholics and the entire Colombian people to "become aware of the reality and of the responsibility we all have" is what the Bishops of Colombia say at the end of their extraordinary plenary Assembly, held in Bogota from 1 to 3 November, "to give thanks to God for Pope Francis’ visit to the country and to deepen the message of faith and hope that he has left us". In the document, sent to Fides, the Bishops thank government, institutions and mass media for the contribution given to the success of the Pope's visit, and "especially the beloved Colombian people for their enthusiastic participation". Echoing the words of Pope Francis, who called on the Colombians "not to stay still", the message underlines, "We are going through a delicate and important moment in our nation's life" in which we cannot deny "dramatic and worrying situations" . Among these, the Bishops first cite corruption, which "has permeated the fundamental structures of society, creating a crisis of institutionality, especially in justice, economics and politics". Therefore the very serious state in which public health finds itself and the increase in drug addiction both in the countryside and in the city, makes people of any age and social condition slaves. "The uncertainty over the implementation of peace agreements with Farc guerrillas and on the future of the negotiations with Eln, as well as the emergence of new forms and new perpetrators of violence" concern the population, as well as polarization and division which do not allow to come up with a common project that the country needs instead. "The attacks on life and the family, such as the ideological manipulation of education, with the support of legislative and judicial environments" constitute other causes of disturbance, as well as the social instability that manifests itself in unemployment, assassination of social leaders, in the difficult condition in which campesinos, indigenous and afrodiscendants live. "We are concerned about the humanitarian crisis in which our brothers from Venezuela find themselves", the Colombian Bishops point out. In the face of this situation, the Bishops launch an urgent appeal, echoing Pope Francis's words, highlighting some concrete paths: "Let us put the human person, his dignity and respect for the common good at the heart of every political, social and economic action". "All of us must be responsible, with acts of goodness and righteousness". Let us increase our solidarity with those who suffer, especially the victims of violence, and at the same time ask the Government for effective solutions especially for health care coverage, as "health is a right, not a deal". Let us join our efforts in the face of drug trafficking and drug addiction: "solutions must be found for social problems in which farmers, traffickers and consumers are involved". Let us strengthen values such as truth, freedom, justice, forgiveness, and reconciliation, without which no authentic and authentic peace is achieved. Let us also reconcile ourselves with nature, treating and protecting the wonders God has given us.